At Arizona Smile Designers, your dental health is our number one concern. That’s why we always encourage our patients to stop by and see their expert dentists in Cottonwood and Sedona, AZ in order to get a semiannual dental exam. While these dental check-ups are important for making sure that there aren’t any underlying problems that you may have with your teeth and gums, they’re just as important for the teeth cleanings that we provide. 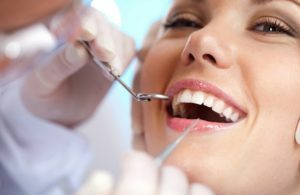 As your Cottonwood and Sedona, AZ dentists, we’re very familiar with the fact that many patients actually don’t understand the importance of regular teeth cleanings. There’s a common belief that as long as a person keeps up with daily brushing, he or she won’t need a professional teeth cleaning. This cannot be further from the truth! Receiving a professional cleaning from a dental hygienist will remove mineralized plaque that can develop even for those patients who have committed oral hygiene routines. This plaque can especially be tricky to remove when it develops in the more difficult-to-reach areas, such as underneath the gum line. That’s where we come in; with our professional teeth cleanings, we’re able to remove this plaque and keep your teeth in as optimal of shape as possible. Best of all, these teeth cleanings are completely painless and shouldn’t cause you any discomfort at all! First, a trained hygienist will come in to clean your teeth. The hygienist will start by scaling the teeth. This is essentially the removal of plaque and tartar from the surfaces of the teeth. This can be performed either with a hand scaler or an electric scaler. The hygienist will follow up by digging into the pockets of the gums in order to remove any plaque that was built up in there. After the plaque has been removed, a teeth polishing will be performed to remove any leftover plaque and also buff the teeth, giving them a shinier and more attractive appearance. When this is finished, your dentist will come in to give you a dental exam. Visit Your Cottonwood and Sedona, AZ Dentists! If you’re looking for a teeth cleaning in addition to a dental check-up or exam, we encourage you to schedule an appointment with your Cottonwood and Sedona, AZ dentists. To do so, please feel free to give us a call at (928) 634-8610 or fill out our online appointment request form. We hope to see you soon and help make sure that your teeth are at their optimal condition!